Little Princess Child Costume.Includes: Jacquard Dress and Matching Tiara. Available Size: Girls - Small, Girls - Medium, Girls - Large. *Shoes Not Included.Look just like a fairytale princess in this pink and white ballroom gown and matching tiara. 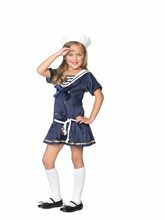 Shipmate Cutie Child 2pc this includes the dress, and a adorable sailor hat to go along with it. Gretchen Girl Child Costume.Age Category - Adult.Includes: Dress, suspenders, white petticoat and choker.Available Size: Girls - Medium (8-10), Girls - Large (10-12), Girls - XLarge (12-14).Product Care: Dry Clean Only.Look beautiful this Halloween You can bet your bottom dollar that there won't be another girl as beautiful as you. if you are looking for a cultural costume ..this is the right place and the right costume for you. Little Miss Muffet Child Costume.Age Category - Child.Includes: Pink and white peasant top dress with attached apron with black spider emblem, choker and hair bows.Available Size: Girls - Medium (8-10), Girls - Large (10-12), Girls - XLarge (12-14). *Socks and Shoes Not Included.Product Care: Hand Wash Separately. Drip Dry. No Bleach.More than just spiders will want to sit down beside her! Bring this classic nursery rhyme to life with this pretty pink and white gingham peasant top dress w ith attached apron and crinoline. Apron features a black spider emblem.